We got a little more adventurous with out seeds started indoors this year thanks to my mother-in-law. 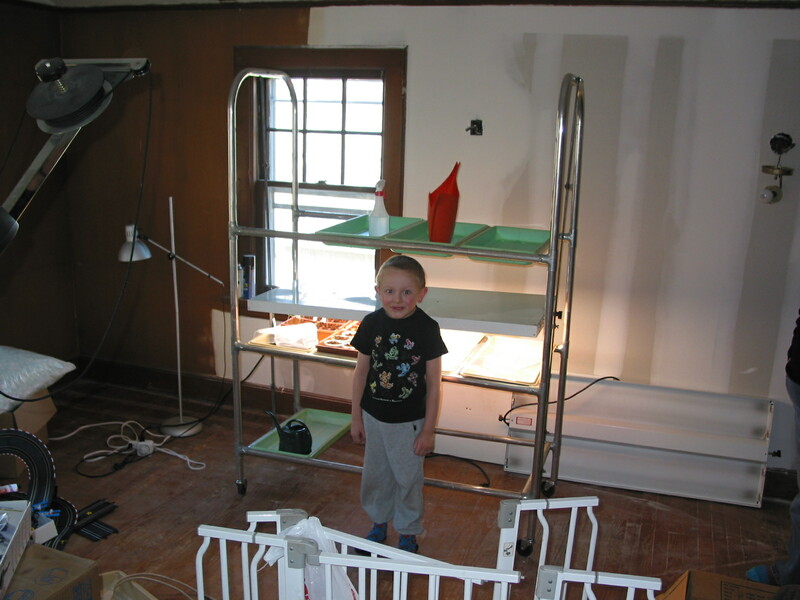 She gave us a ginormous plant light set up (3 shelfs, each shelf 4 feet long with 4 bulbs) which increased out seed starting capability six-fold. We set it up in the attic because the thing is too tall to go in the basement. So we’ve got flowers, ‘maters and some herbs going so far. And we haven’t even filled one shelf. In addition to the seeds planted last weekend I planted a few lettuce and parsley seedlings from the garden center. After nearly a week, the lettuce is visibly larger. We’ll have a few leaves in our salad next weekend, perhaps. I was worried about the seedlings as the night after I planted them the temp dropped down to 26, but those plants are hardy little suckers. Besides, I’m going to have so many seedlings from the plant lights that a little die off in the garden might not be a bad thing. OK, there is something really creepy about S.’s expression in this picture. Like he has been living under a grow-light all winter!